As millennials, we have access to more businesses than ever before. It has never been easier to choose one window replacement company over another. If I have to pinch and zoom and scroll and scour your site to find out what time you sell cat food until, I'll never find out because I've already hit the back button and found your competitor's website. Guess who I buy cat food from now? To be fair, this doesn't apply to all businesses—just most of them. Neither the website nor the bartender of my local dive bar should be clean-cut or user-friendly. It's part of the charm. I get that, and I'm with you. That being said, even brick-and-mortar businesses benefit from a great website. Web traffic leads to foot traffic which leads to more sales. A hard-to-navigate website actively deters customers from ever walking through your door. Not sure if your website is deterring customers? Take this test & find out. 1. Your website will look a lot better. When switching from desktop to mobile, the perspective flips from a highly horizontal style to a very vertical-heavy view. Your website needs to flip with it. Every aspect of the content on your website (the text and images that appear) needs to format properly across each device: desktop, smartphone, and tablet. Typically you will want a highly accessible, responsive menu button that allows visitors to retrieve the information about your business that they need. 2. Your website will perform a lot better. Wanna know a huge part about websites? Clicking stuff. Gotta be able to click stuff, love clicking stuff. The menu bar? Links to your Contact page? Your company's phone number? That big ol' BUY button? Don't want to be able to click it, need to be able to click it. I'm being a little silly here, but it's the truth! Your website should have one main call to action. Something that, ideally, every single visitor will do after learning what you're all about. If a large portion of your visitors cannot find the button you want them to click because the site didn't format properly to their iPad, that's not on your potential customer. That's on you. 3. 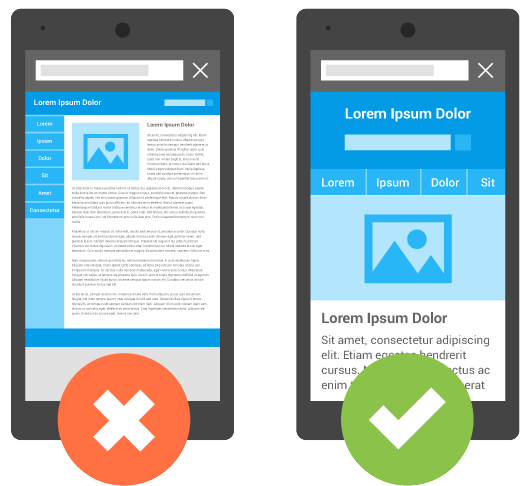 Google rewards mobile-friendly websites and punishes the rest. In 2015, Google announced that they would begin expanding mobile-friendliness as a page ranking signal. They understood that more people were performing searches on their mobile devices than ever before and decided to provide "relevant, high quality search results that are optimized for their devices." If your website is not optimized for mobile devices, you are being buried by arguably the most powerful company on Earth. Not ideal. Don't take my word for it, take Google's. 4. More than half of internet traffic is happening on mobile. 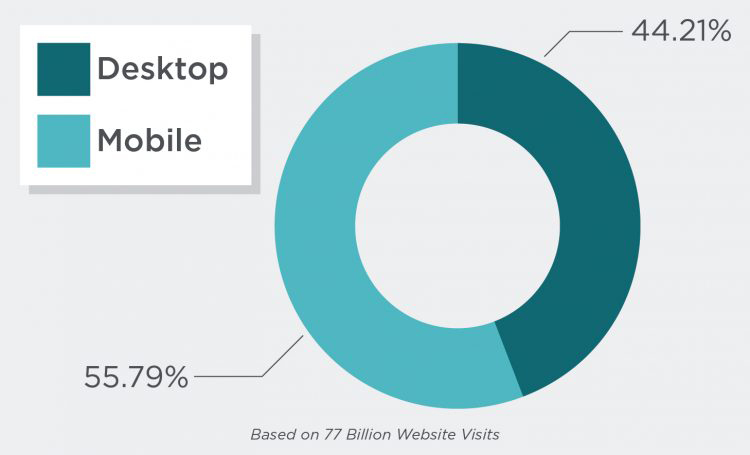 Desktop users tend to engage more deeply with site content, but in terms of sheer volume, mobile dominates. I don't take my laptop with me everywhere I go. My phone never leaves my pocket. The "mobile first" revolution has shifted from being applicable only to technology-based businesses to every business. Every. Single. Business. You may not have an interest in promoting your brand on social media, but the very least you can do is equip yourself and your business with a website that can easily be found in an internet search performed on a mobile device. Once found, visitors will expect your website to be welcoming, understandable, and engaging. Purchasing goods or services from a company that is mindful of their online presence is important to me. And it's not just me - it's millennials (and Gen X'ers, too) as a whole. We are the largest generation in United States history. We are the first generation of digital natives. Our attachment to mobile devices has shaped the way that we shop. We have come to expect instant access to just about everything. The success of your business relies on your ability to provide value to your customer throughout every step of the process - from discovery to checkout. Provide that value and customers will reward you with sales. Need help updating your website?